Cardio-vascular fitness is an essential part of a healthy, active lifestyle. If you regularly challenge your heart, lungs, and the aerobic work capacity of your muscles, you will be pro-actively enhancing your longevity, and will reduce your risk of ailments such as heart disease, stroke, high blood pressure, circulation problems, breathing problems, diabetes, and some cancers. If you regularly participate in a physically active sport, then this type of training will enhance your performance and enjoyment of that sport. 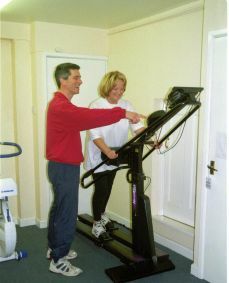 There is conflicting advice regarding how much cardio-vascular exercise we should be doing for our health and fitness. Some say 30 minutes of easy-to-moderate paced exercise 5 days each week is enough, whilst others suggest a need for more intense bouts of vigorous exercise. My advice will help you to find a level that best suits YOUR needs. Firstly, you should decide how fit you want to be, and how much you enjoy this type of exercise. If for example, you find getting very out of breath and sweaty to be off-putting and you only want to be fit enough for everyday living, then moderate cardio-vascular exercise will suit you the most. You’ll be amazed how regular sessions of moderate intensity can improve your health, stamina, and aerobic capacity. Of course, if you are aiming for a high level of fitness and you enjoy a physical and psychological challenge, then a programme of structured high intensity training will help you achieve your goals. My gym has cardio-vascular equipment for cycling, rowing, cross country skiing, stepping, low-impact jogging and various levels of circuit training. As for joggers and serious runners, the open space of the Downs is 30 seconds from my door step, so all kinds of outside workouts are possible.